When this was published there were two areas of controversy. The first was that Barry Brenner, who was running the RENALL Trial simultaneously, shut down his trial after the HOPE trial was published because the DSMB thought that it was not ethical to withhold ACEi/RAAS from people. This left Lewis and his team looking like monsters for continuing the trial. The second controversy was the third arm of the trial. Irbesartan, okay. Placebo, okay. Amlodipine...really? 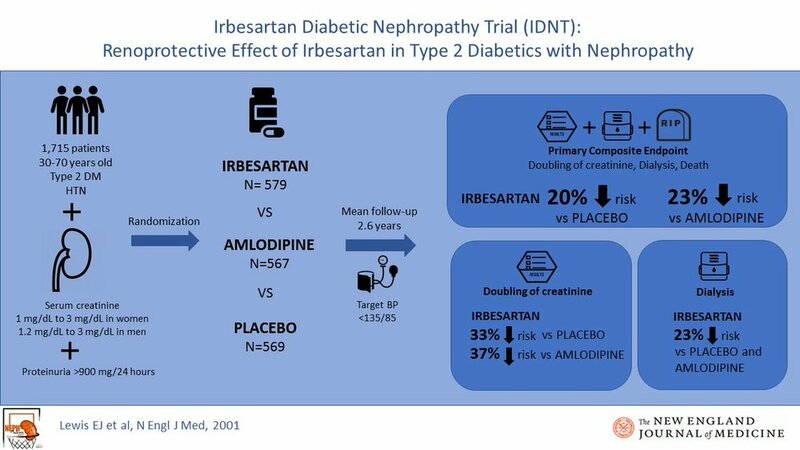 How much better would the trial have been if it proved that both ARBs and ACEi were protective in type 2 diabetes. As it stood we only got half the information we wanted. Everyone assumed that the renal protection would extend over both classes but for years ACEi lacked the Grade A evidence found with ARB in type 2 DM. And if not the ACEi, how about a non-dihydropyrisdine calcium channel blocker that have been shown to reduce proteinuria? All and all small blemishes to one of the landmark clinical trials in diabetic nephropathy. Regarding non-dihdropyridine CCBs, this is a still a relatively unanswered question whether they offer specific advantages over DHP-CCBs. At one time, I heard Bayer (promoting Adalat XL at the time) was considering a head-to-head trial with diltiazem XC. But of course, it never happened and so the theory never progressed beyond George Bakris' original work (a good article to add this repository). The apparent advantage of DHPs over non-DHPs for blood pressure potency also didn't help the cause of non-DHPs.